More than a year after the MPAA and RIAA announced their groundbreaking anti-piracy deal with U.S. Internet providers, the first warning letters are yet to be sent out. Previously, July 2012 was coined as the start date but the responsible parties are still not ready to launch. While TorrentFreak has learned that various ISPs will start the implementation at different times, it remains a mystery which company will be spying on filesharers. Somewhere in the near future the Center for Copyright Information (CCI) will start to track down online ‘pirates’ as part of an agreement all major US Internet providers struck with the MPAA and RIAA. The parties agreed on a system through which copyright infringers are warned that their behavior is unacceptable. After five or six warnings ISPs may then take a variety of repressive measures, including temporary disconnections. When the deal was first announced in July last year the first ISPs were expected to send out the initial warnings before the end of 2011. But this deadline passed silently, as did the July 2012 date subsequently mentioned in the press. TorrentFreak contacted CCI for an update, and the group ensured us that they’re working hard to get things up and running as soon as possible. “With regards to timing, CCI is rigorously working towards implementing the Copyright Alert System in a way that is consistent with the Memorandum of Understanding (MOU) and with the needs of subscribers,” a spokesperson told us. 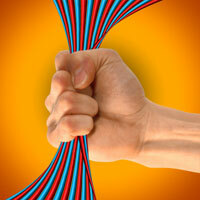 The CCI now hopes that the first ISPs will begin sending warnings later this year. However, the group also made it clear that providers will roll out the alert system at their own pace. Exactly why the roll-out has been delayed remains unanswered, but such a massive delay suggests that not everything went as planned. Another question we’ve asked numerous times – which company will be hired to track BitTorrent users – also remains unanswered. All we got back was a comment that CCI is not ready to announce who will “evaluate” the identification technologies. “At this time, CCI is not ready to announce the experts we will use to evaluate the methodologies used by the content owners and ISPs to identify alleged piracy and deliver notices to the right consumers,” the CCI spokesperson told TorrentFreak. The above suggests that the company that does the tracking might not be made public at all. This might be a deliberate choice to prevent protest actions, but it certainly doesn’t add to the transparency of the scheme. Meanwhile, TorrentFreak is getting reports from VPN providers who have seen a significant uptick in new subscribers from the US. Presumably, a large percentage of these new subscribers are signing in anticipation of the “six strikes” scheme. Although the measures that will be imposed by Internet providers are not that scary, there is a worrying backdoor built into the deal which allows the MPAA and RIAA to request personal details of repeat infringers for legal action.